Natural Hair Products Combo – Free Shipping! Darshana Natural Indian Hair Oil will rejuvenate, hydrate, and transform your hair. It is made with an ancient Indian Ayurvedic formula rich in antioxidants, omega oils, and vitamins that will moisturize and restore your hair. You will see results after just one use of this wonderful natural hair product. We invite you to experience the Darshana difference! Darshana Natural Moisturizing Shampoo and Conditioner will moisturize, condition, and smooth hair of all types. They hydrate, soften, and defrizz your hair while making it look and feel healthier. Our custom blended Indian ayurvedic botanicals promote healthy hair while helping detangle and condition. These natural hair products are safe for color treated hair and its 18 amino acids will strengthen and protect it from environmental damage. Also, our ayurvedic shampoo and conditioner are pH balanced to provide gentle cleansing without stripping your hair and will help close the cuticle after conditioning. This will reduce frizz and flyaways and assist people with low porosity hair. There are no sulfates, parabens, silicones, artificial fragrance, phosphates, phthalates, or animal testing in our natural hair products. 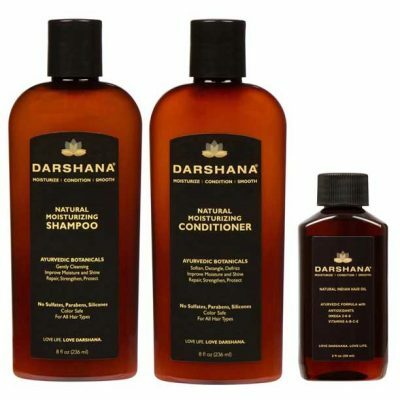 Darshana Natural Moisturizing Shampoo and Conditioner are a natural alternative for long term hair care.